…and a little child will lead them. 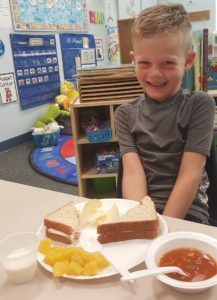 Daily lunch options include, packing a lunch for your child or ordering lunch prepared by Grace Preschool. When bringing a lunch from home, we ask that you include all nutrition components. Purchasing a school lunch guarantees this because we follow food program guidelines. Alert us of any allergies so that we can keep everyone safe! To provide a secure and fast online ordering system, Grace Preschool partners with BOONLI. For your convenience, on Boonli, you can order lunches, prepay and manage student accounts. Monthly lunch menus are available, and are nutritious, varied and preschooler approved. Current families~ For ordering options, visit www.boonli.com and register using the password provided to you. Let us know if your child will be absent on a day you ordered lunch, because a credit will be issued.